In computing, a task is a unit of execution or a unit of work. The term is ambiguous; precise alternative terms include process, light-weight process, thread (for execution), step, request, or query (for work). 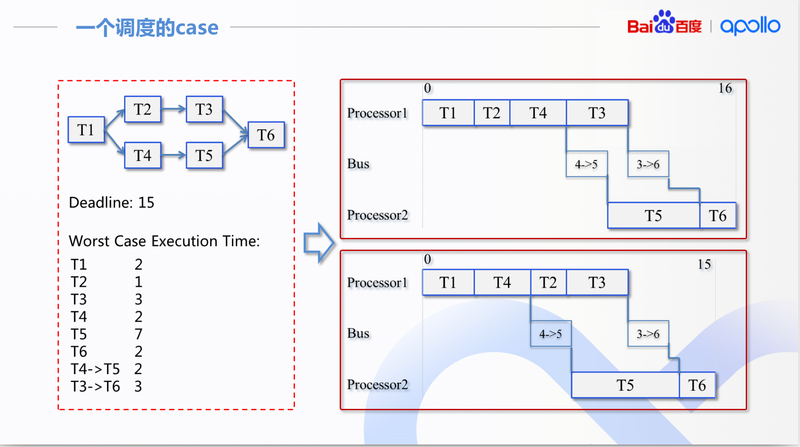 In the adjacent diagram, there are queues of incoming work to do and outgoing completed work, and a thread pool of threads to perform this work. Either the work units themselves or the threads that perform the work can be referred to as "tasks", and these can be referred to respectively as requests/responses/threads, incoming tasks/completed tasks/threads (as illustrated), or requests/responses/tasks. 延迟最优化的情况下, 程序应当全部是event-based的task, 从data src开始向下一直到最下的sink. 音视频的开发就是个延迟敏感的典型, 所以我们可以看到一些音视频开发框架采用的pipeline概念. task按照classic的方法调度, 背后的实现是multi prioty queue, 调度任务的时候, 从优先级高的queue开始找到需要执行的程序. 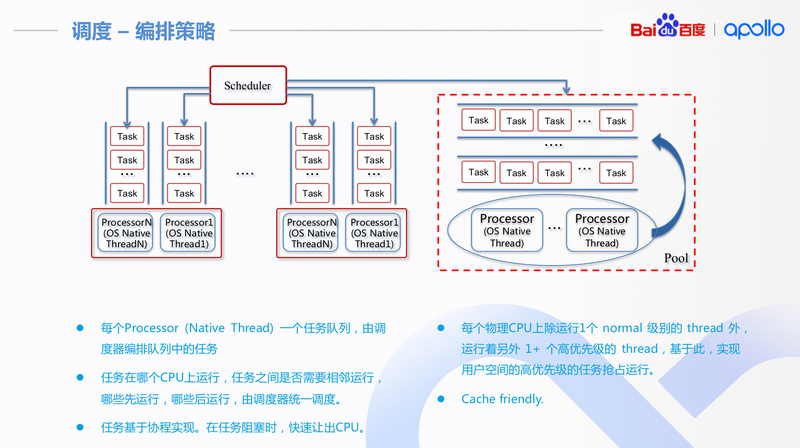 翻译过来就是, 建立一个processor(thread)为2的group, 使用的SCHED_FIFO的调度策略, 就是实时调度, 可以抢占. 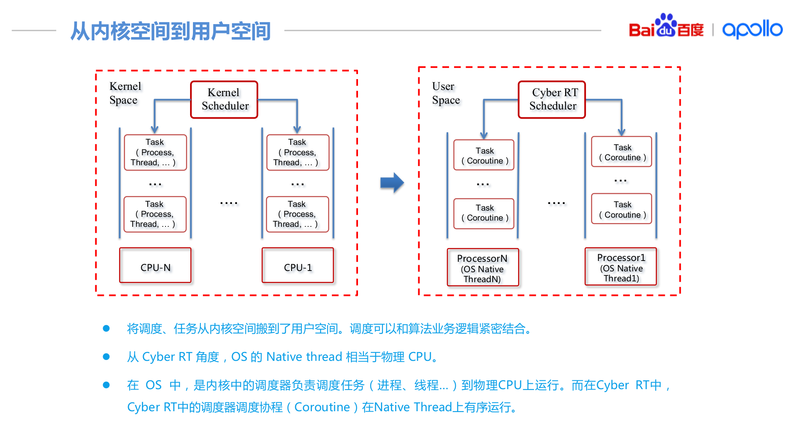 control_/apollo/planning和canbus_/apollo/control任务专门绑定到processor 0上, canbus的优先级为2, 比默认1要高. 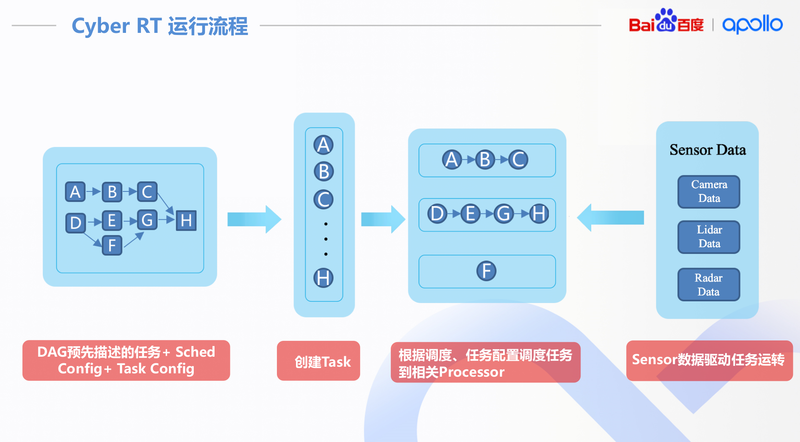 task按照choreography的方法调度: processor 0只给两个task, canbus用完了给control. 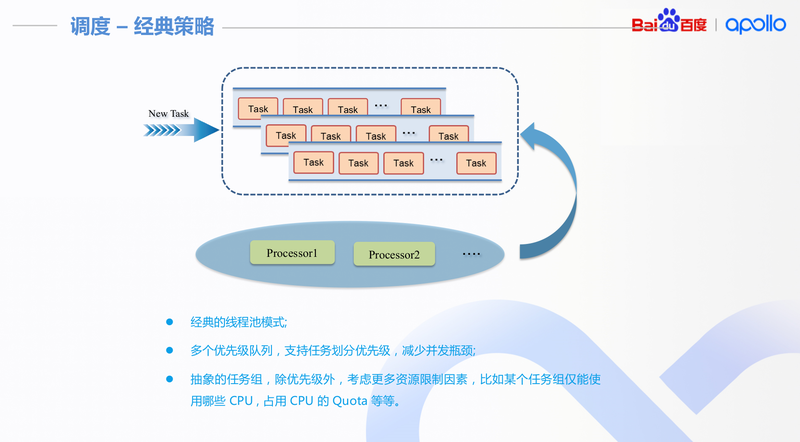 guardian在processor 1上, 是实时进程, 只要guardian有需要, 可以随时抢占processor 0的物理cpu. 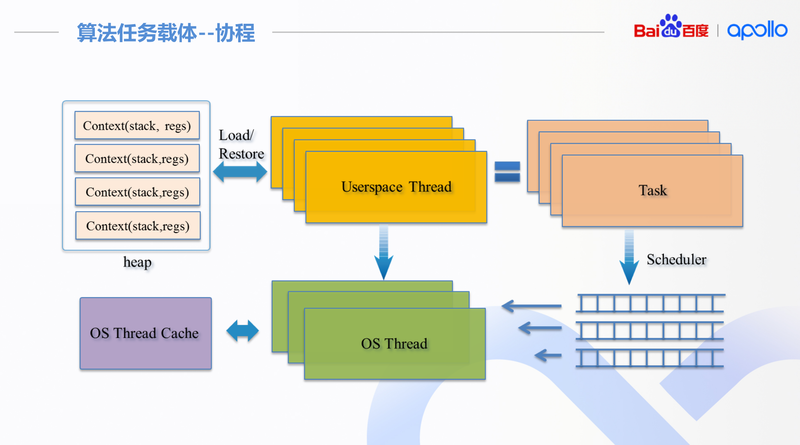 简单的scheduler做法, 就是使用thread pool + kernel scheduler(优先级/cfs)的方式.